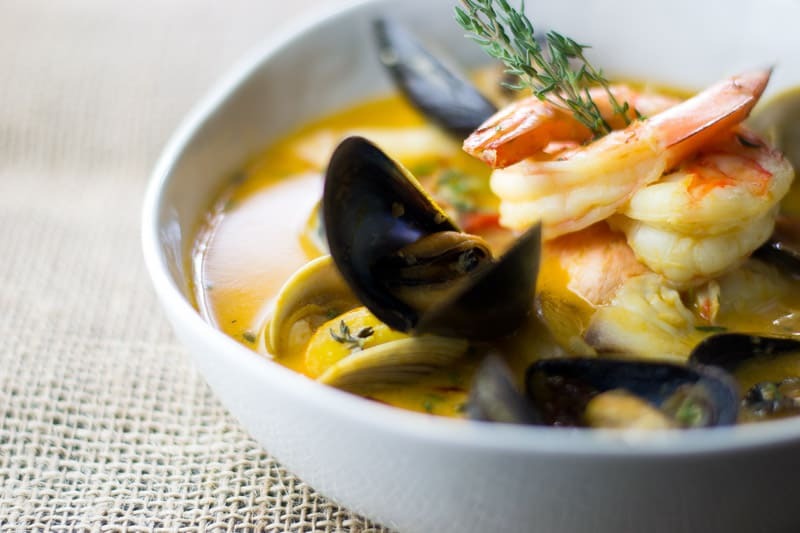 Our traditional Bouillabaisse is a fragrant saffron-infused, zesty stew resplendent with mussels, clams, shrimp and fish. Let me just prepare you for the tragic news that this is not a Bouillabaisse. No Bouillabaisse prepared outside of the South of France can be. 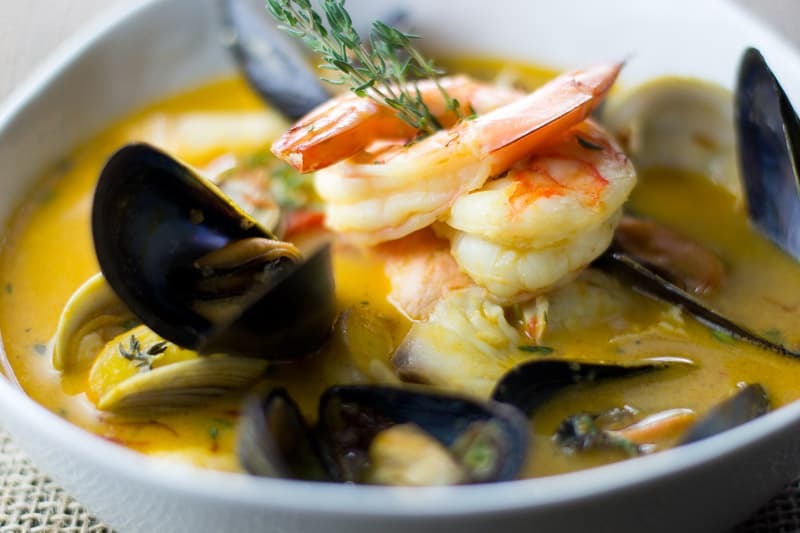 Our recipe is spot on, and the flavors are reminiscent to the Bouillabaisse I had several times in Marseille. But, still, it’s not a real Bouillabaisse. 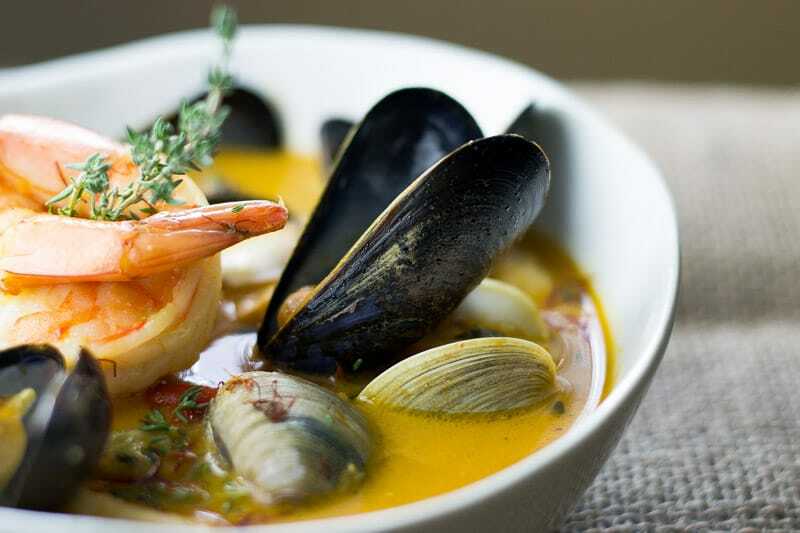 For it to be authentic, at least according to any French chef or Mediterranean fisherman, a Bouillabaisse is only true if the fish in it was plucked straight out of the Mediterranean. So instead of weaver, stargazer, anglerfish or conger eel, which you’ll be hard-pressed to find locally, we’ve used cod and salmon as great standbys. While the broth is the true essence of a superb Bouillabaisse, it all begins with selecting the best seafood. Traditionally, shellfish is usually not incorporated into the dish and when in France, you might be considered a touch too snooty for adding them. However, we believe everyone is an aristocrat deserving of tasty mussels and clams. Have your guests bow and curtsy upon serving. Make sure those mussels are alive because a dead mussel is an inedible mussel. To ensure they’re alive and kicking, check that the shell is completely closed. If you notice one slightly open, give it a sharp tap. If nothing happens, sadly, you must part ways. But if it closes quickly, well the end is near anyway and definitely safe to eat. Because the mussels are alive that means they’re breathing, so make sure you don’t take them home in a plastic bag. Disregard any that are damaged, chipped or fractured. Lastly, take a deep whiff. Funky? You know what to do. Some mussels have “beards”, which is a byssal thread or fiber that emerges from the shell. Just pull it before adding to the Bouillabaisse. When cooking, be sure to add your clams first as they take much longer to open. Mussels should be added about five minutes after the clams have been added to ensure your mussels are not overcooked. Now we move onto the base of the broth. Get this right, and everything will taste amazing. The saffron potatoes make the dish even more rustic and filling. When cooking your saffron potatoes, please be sure to bring your water to a boil and salt your water first. I’m going to make this dish again for the family to celebrate Bastille Day at home and expose the kids to a bit of French culture, but we shared it with you early because the success of dish is all in the slow, patient preparation. And requires a few days to get everything ready. The broth requires some attention to get the creamy emulsification that beautifully coats all the seafood. It shouldn’t run off like a soup would but cling to the fish and shrimp. Make sure you bring your broth to a medium boil to break down the oil into smaller molecules. That achieves the emulsification for a proper Bouillabaisse. I have some more grim news for you. Don’t buy shrimp that’s already deveined and shelled, at least not for this dish. That process tends to strip the flavor a bit to create a bland shrimp. We want the shrimp to retain as much flavor from the shell to essence the broth. But do get them with the heads removed, because who wants to deal with that? And they make the shrimp spoil faster. Get your shrimp frozen. It’s a no-brainer. They’ll be fresher, and you can keep them frozen for several weeks if needed. Look at the color, too. Brown, black spots, yellow or anything off from the standard pink is a no go. Aim for medium-sized shrimp, about 20 to a pound. If you want to get specific about the species, we usually get a Gulf White or Gulf Pink. But most any will do. After the shellfish have been added to the Bouillabaisse and both the clams and mussels open, add your shrimp. The residual heat from the broth will gently cook your shrimp and give it a nice texture, but be sure to put a lid on the pot to keep the temperature locked. Uncover after 10 minutes or so. For this recipe I always go with Manila Clams, the brine flavor they release when they open up is like nothing you have ever tasted. A rich earthy, floral fish stock. Fisherman created the dish from their daily catch, so it shouldn’t keep at all. But if you have leftovers, it should keep for about two days. How much do the ingredients cost? Saffron, shrimp, and shellfish can cost a pretty penny, so around $50 for everything. How should I thicken it? 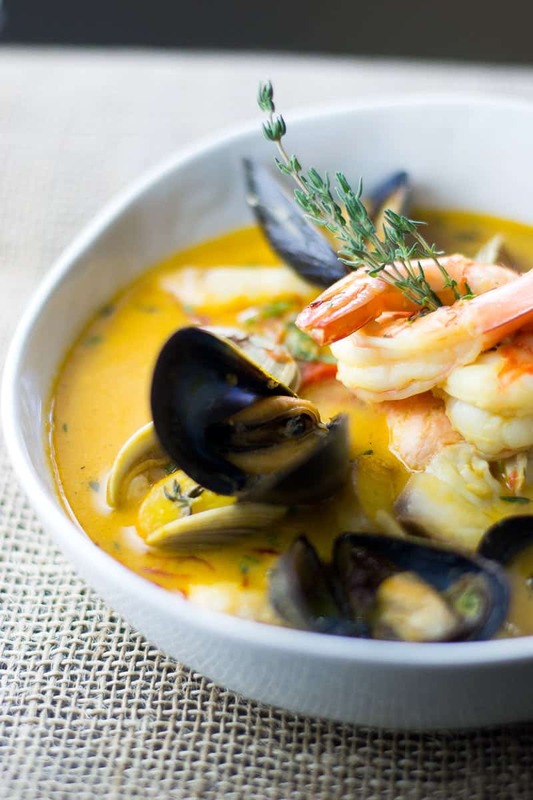 If you find that your bouillabaisse is too thin and want to thicken it, just add 1 tbs. of white roux. Be sure to only whisk the roux in after the bouillabaisse has come to a boil. How should I reheat it? I don’t recommend reheating bouillabaisse because the shellfish will dry up and shrink. But if you must, please remove the shellfish (if you haven’t eaten it all). Bring the broth to a slow simmer and quickly serve. You can always add fresh clams or shrimp for another round of goodness. What fish is good in a Bouillabaisse? Because this is a fish based stew, you can add just about any fish you want, but I would suggest any white fish, example- halibut, cod, tilapia, grouper, or sea bass. The recipe is a delightful process. Enjoy it. Be sure to soak your clams in a salted, cold water bath. It’ll force the clams to expel any grit or sand they may be holding to for whatever reason. If saffron is not in your budget, try adding a little turmeric and paprika. You can also use lobster and crab but add the lobster first then the crab. Crab does not take long to cook, and crab meat tends to break up easily. 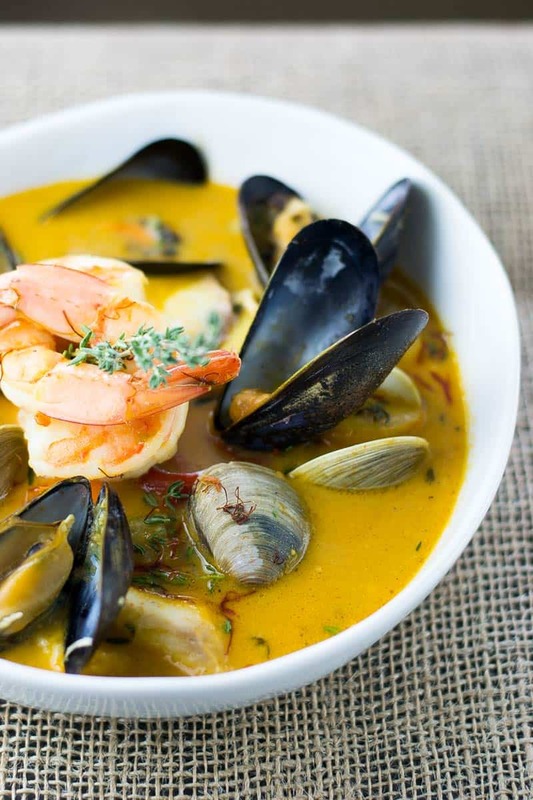 You don’t want your bouillabaisse to become a chowder. Save and freeze the shrimp shells. 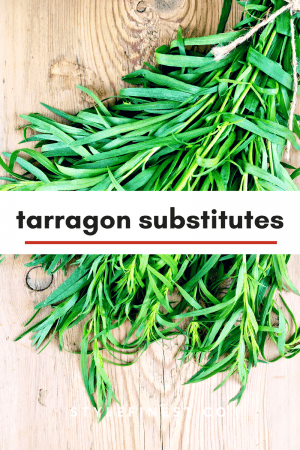 You can use them as a base for other stews like our Lobster Bisque. Chances are you’re going to have leftover mussels and clams, so experiment with other tasty shellfish recipes. Our friends at Foodal have a dynamite recipe for Linguine with Baked Clams. A provençal seafood stew from the south of France finished with Pernod. then add your chicken stock and simmer for another 5 minutes. add peels from 1 orange, white peppercorns, bay leaves, thyme, fennel seeds, fennel bulbs, fresh marjoram, paprika, saffron, and cayenne. add the clams first, then about two minutes later add the mussels. simmer 2 minutes. add the peeled and deveined shrimp. shut off heat and allow shrimp to cook two more minutes. In a small pot of salted water, bring 3 medium sized fingerling potatoes to a boil. After 5 minutes strain and set aside. Steep 2 table spoons of quality saffron in simmered water, for about 5 minutes. Add fingerling potatoes to saffron water and set aside for 30 minutes. After 30 minutes, remove potatoes from saffron water and add to Bouillabaisse. finish with Pernod and let it rest for 5 minutes. Yummy! This looks amazing! I wish I could smell it through my computer screen! Thanks for sharing! I bet that broth is incredible and full of flavor! Such a beautiful seafood dish! This looks so amazing – it’s making me hungry and it’s not even breakfast time yet! Love the tips on buying seafood – so many people are put off because they don’t know what to look for! Great tips on the seafood! And this looks wonderful, such a great color. Yum!! Thanks, Kim. I hope you enjoy it with friends and family. Whoa. I learned something new today. With that definition of a bouillabaisse, I don’t think I have tried it before. The saffron potatoes is an interesting addition to the dish. 30 minutes of cooking times is worth the wait. This looks like a delicious recipe. I love mussels, but I had no idea what to look for when buying. Now I know. I had the best mussels ever on a patio overlooking the harbour in Charlottetown, Prince Edward Island. I have never eaten muscles or clams, but this looks delish! And I had no idea buying deveined shrimp loses flavor. That is so good to know. Yeah, any time you take a shrimp out of the shell then let it sit for hours or days, will hurt the flavor. Plus when you buy deveined and unshelled shrimp, you have no idea how long it’s been sitting around. Hey Monica, Thank you for your kind words, If there is anything I can help you with please let me know. Thank you, Ali. Hope you enjoy it and please let me know how it works out for you. I’m one of those people that absolutely LOVES the taste of seafood and would LOVE to eat this! I will have to give it a go and let you know what I think! Thank you, Chloe. Can’t wait to hear back from you. I have never seen a recipe of Bouillabaisse anywhere. And now I have. 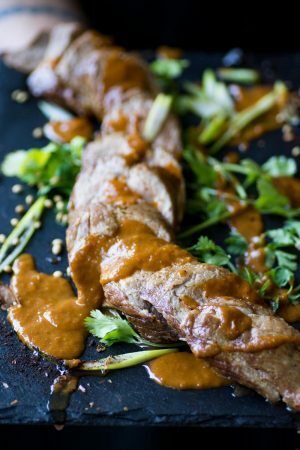 I have had it in a couple of places and it was simply amazing. But then again I am a huge seafood fan. so I will definitely be trying this one out. Thanks, David. Hope you enjoy it. Saffron infused dishes have a beautiful aroma! I also use fennel seeds and peppercorns. The combination of these three ingredients can be very tasty! Love the way you have used these flavors in your dish. Yay!! Am I the first commentor that as actually made the recipe?? First I want to say, it is TO DIE FOR. TO DIE FOR. I am so grateful to you for sharing, and I can’t wait to make this for when my hubs comes back from sea. He too will die, because it is that good! 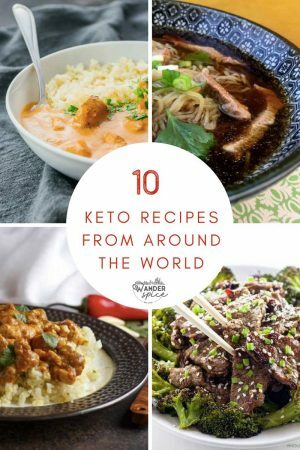 I will definitely be checking out your other recipes <3 Thanks again!